Despite the clouds and overcast skies, the Falcon 9 lifted off on time at 9:39 a.m. EST on Feb. 19. 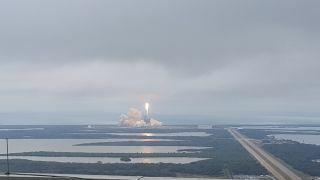 CAPE CANAVERAL, Fla. — A storied NASA launchpad hosted a dazzling pyrotechnic display as a SpaceX Falcon 9 rocket roared to life on Sunday morning (Feb. 19), sending nearly 5,500 lbs. (2,500 kilograms) of cargo on a journey to the International Space Station. The cargo, which included crew supplies, tools and science experiments, was packed inside a Dragon cargo spacecraft attached to the top of the 210-foot rocket. Falcon breathed fire and roared loudly as it quickly disappeared into low-hanging clouds after an on-time liftoff at 9:39 a.m. EST (1439 GMT) from NASA's historic gateway to space: Launch Pad 39A. Roughly 12 hours before the scheduled launch of SpaceX's Falcon 9 rocket, SpaceX invited members of the media to view the rocket on the pad. The historic site saw the launch of most of the Apollo moon missions as well as many space shuttle flights, including missions to repair the Hubble Space Telescope. Sunday's launch marked a new era for Pad 39A, which SpaceX hopes will one day ferry astronauts to Mars and beyond. The road to Mars began nearly five decades ago as Neil Armstrong, Buzz Aldrin and Michael Collins strapped into their seats aboard the Apollo capsule, which sat atop the world's most powerful rocket at the time — the Saturn V. That vehicle, as well as many others that followed, was assembled in NASA's iconic Vehicle Assembly Building (VAB) before it was rolled out to the launchpad atop a massive crawler transporter. From my spot on the roof of that same building, I prepared to watch SpaceX make history by launching the first commercial rocket from a once-government-only facility. Rain drizzled and gray clouds hung overhead as journalists, bystanders, NASA employees and researchers whose payloads were nestled in Dragon's trunk gathered to watch the launch. Members of the media were present in three different viewing locations: the press site, which is home to the iconic countdown clock and was the premier viewing location during the shuttle era; the NASA causeway; and the VAB roof — and each location offered a unique vantage point. A view from in front of the massive Vehicle Assembly Building. For this launch, I was lucky enough to snag a coveted spot atop the VAB roof. As the largest single-story structure in the world, the VAB stands 525 feet tall (160 meters), and it's incredibly difficult to gauge how massive the building is until you are walking through it. The building was previously used to mate space shuttle orbiters with their boosters and external fuel tanks for before flight. Before the shuttle launches, the building was originally designed to assemble the stages of the 363-foot (110 m) Saturn V rockets that launched astronauts to the moon. A view of new SLS platforms being installed in the VAB's High Bay 3. Once inside, I could feel the history and promise for the future as we passed by crews working to upgrade the building to support NASA's heavy-lift rocket — the Space Launch System (SLS) — and other future endeavors. About two-dozen journalists made the trek to the roof. First, we hopped on a service elevator that took us to the 34th level. Then, we walked across a catwalk to a special elevator that would take us the rest of the way to the roof. The roof elevator is tiny, only able to carry about six people at a time, so it took several trips before everyone was topside. How many journalists can one VAB elevator hold? The rain was coming down slightly harder as we stepped out onto the roof and quickly surveyed the terrain for a spot to stash belongings out of the rain. Like several others, I took shelter underneath one of the building's massive air vents. The rain quickly subsided, but the vent's overhang offered a nice reprieve from the rooftop's windy conditions. Standing on top of the roof, we could see a plethora of launchpads spread out in front of us, including SpaceX's other pad — SLC-40, which was damaged in a Sept. 1 explosion — and the first-stage landing site (LZ-1) off in the distance. Saturday's weather was absolutely perfect, but unfortunately there was an issue with the rocket, resulting in a 24-hour delay. Weather conditions didn't look promising for Sunday's launch. The weather conditions seemed inhospitable for a launch, as skies on Sunday were heavily overcast, with the threat of rain showers lurking nearby. Just 24 hours prior, the weather was absolutely perfect during the rocket's first attempt to launch, which scrubbed 13 seconds before liftoff due to an issue with the rocket's second stage. This time, it seemed less likely that Mother Nature would allow this Falcon to take flight. But just in time, the weather cleared enough for the rocket to lift off, roaring to life as it climbed into the clouds. The rocket could be heard long after it disappeared from sight. Approximately 8 minutes later, the Falcon reappeared from its cloudy veil, this time descending toward its designated landing pad and unleashing a powerful sonic boom that thundered across the sky. The sound reached us just after the rocket had touched down, catching many viewers by surprise. Witnessing a rocket launch is like watching the perfect physics experiment in action. First you see the bright flash of light and billowing smoke as the engines ignite, and the vehicle rises off the pad. Then, several seconds later, you can hear and feel the shockwave from the rocket. Emotion hits you like the wave of sound from the rocket, too. This was SpaceX's first daytime landing at this site, and it was incredible to see the rocket go up, and then see its first stage head back to Earth. The previous two land landings were at night, so viewers could only see the glow from the engines as the Falcon launched and subsequently landed. SpaceX now has eight landings under its belt, with three boosters touching down on solid ground at LZ-1. The company is not shy about its goals for reaching Mars in the next decade. In order for that to happen, however, the cost of space travel needs to be drastically reduced. Reusable rockets are the key to making this happen, according to SpaceX, and each time the company is able to safely launch and recover a booster intact, we inch one step closer to Mars.